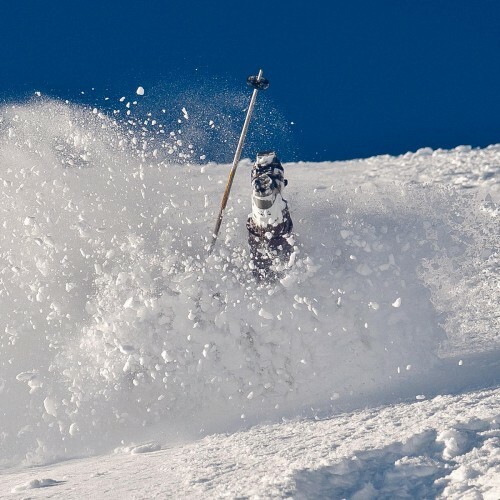 Crescent Spur is a heliskiing and helicopter snowboarding operation run by experienced guides and staff. We offer two vacation types: Private Packages tailored around your own group of 10, and Semi-Private Packages for smaller groups and individuals. Private weeks are limited to 10 guests, whereas Semi-Private weeks are open to a maximum of 20. Packages are available for 5 or 6 days, and most years are fully booked, months in advance. Our founders built Crescent Spur Heliskiing from the ground up, since 1992, and are still active in daily operations. They’re serious skiers, with Mark skiing over a million feet a year. 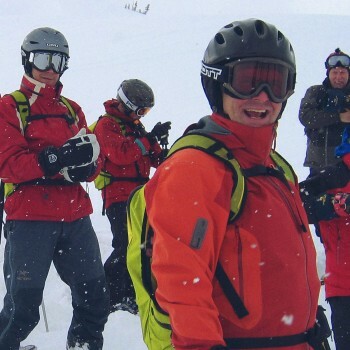 Regulars tell us they enjoy skiing with our experienced guides, year after year—and how Mark does everything possible to find the very best skiing and snowboarding. Crescent Spur isn’t a big corporation; instead, we cater to small groups of (mostly) repeat clients. You won’t find any crowds of tourists here. 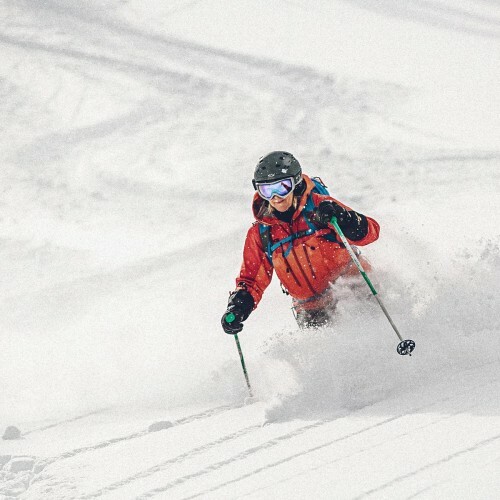 We’re devoted skiers, and want to show every one of our visitors a personal, one-of-a-kind heliski adventure they’ll remember for the rest of their lives. Safety is always top-of-mind at Crescent Spur, and we take an active role in HeliCat Canada, our industry’s professional association. Every visitor’s week begins with comprehensive safety orientation and training. Guests are trained in the use of avalanche transceivers, avalanche backpack use, and hand held radios—all supplied by Crescent Spur. They also participate in a helicopter safety and orientation review. This training equips visitors with an understanding of our aircraft and safety considerations while in the mountains. Our helicopter is a state-of-the-art Bell 205 with notable lifting capacity. This machine holds 10 guests and 2 guides, and is outfitted with precision equipment that allows our pilots to operate safely and accurately. Crescent Spur pilots are experienced in mountain flying—particularly in winter conditions—and are supported by highly trained engineers who adhere to strict maintenance schedules. 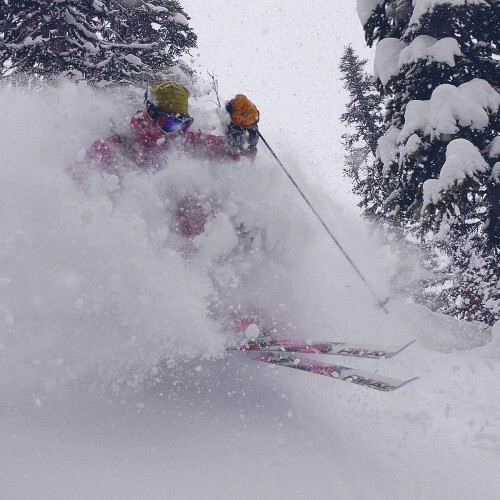 We believe the quality of one’s ski experience directly correlates with guiding expertise. So, we provide two guides per ten guests, allowing you more options for customization. All of our guides are certified and meet, or exceed, industry qualification requirements. They have decades of direct experience in the mountains, and extensive expertise in backcountry skiing, avalanche forecasting, and safety—as well as first aid knowledge, mountain rescue skills, and group management capabilities. The day’s program is led by our team of guides, many of whom have more than 10 years with our company. Our area of over 1,500 square miles in the Northern Rockies and Northern Cariboos receives an abundance of deep, dry, snow that makes for unforgettable skiing and riding. However, mountain conditions can vary from day to day, and can sometimes give us the challenge of difficult snow conditions such as crust or heavy snow. Our guests come from all over the world. We have a large contingent of Americans, an increasing number of Europeans, and a handful of Canadians. Our visitors are avid skiers, but not necessarily extreme. 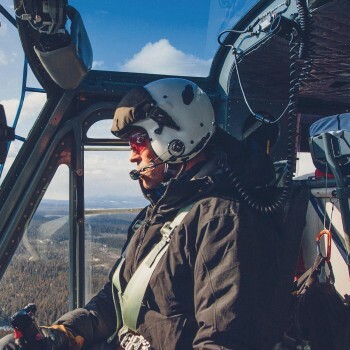 They typically range in age from 30 – 65, with some very dedicated heliskiers in their 70s. Our guests appreciate, and expect, quality operations and personalized service. Those who return often cite the whole experience for bringing them back—the terrain and the skiing, our natural environment, our guides and staff, the good food, camaraderie, and the after-hours activities. Everyone leaves Crescent Spur with something different. For some, heliskiing is about escape and adventure; for others this is a place to relax and reconnect with friends.